From now on, all of my online fundraising for The Sir Bobby Robson Foundation and The Children's Foundation will be done through Virgin Money Giving. I now have 1 page for both charities. Behind the scenes, this which will make reconciliation much easier and less time consuming. I'll also be able to keep the amounts raised online for both charities at an equal amount. The real benefit of using Virgin Money Giving, however, is the fact that more of a sponsor's donation will go to the 2 charities. By my calculations, if I'd used Virgin Money Giving for the run across the USA then an extra £2500 would have been given to the charities. If you would like to sponsor me for the run across Australia then a donation can be made via http://uk.virginmoneygiving.com/rungeordierun1. These are crucial times in the current campaign. I really feel that what happens in the next 4 to 6 weeks will have a significant bearing on the run across Australia. First and foremost, getting myself physically prepared to run 41 miles per day is the main priority. Surprisingly enough, I haven't done a great deal of running recently. The main focus has been on burning calories and fat in the gym. I've lost 6% body fat so far this year and have gained a lot of strength in the process. There is still a long way to go but there has been some good work done so far in 2013. I aim to start running in ernest in April and will slowly but surely condition my body to run the required 41 miles per day. This is the more the kind of training that I'm used to. I slogged out many miles in the build up to the run across the USA. The difference this time must be a sensible and sustainable diet around that kind of mileage. My weight ballooned to 18.5 stone before I ran across the USA. If that happens again then I will stand no chance of being able to run the required 2600 miles in 70 days. Under the guidance of David Fairlamb I have learned to follow the Paleo way of eating recently. It's a pre-agriculture diet. Some call it the Cave Man Diet. It's basically a lot of lean meat and leafy green vegetables. The general rule of thumb seems to be if you can kill it or it grows naturally above ground then you can eat it. It's served me well so far but the real challenge will be eating like that when I step up the miles later this year. It should take me to mid June to be able to run 40+ miles in training and the 3 months after that will be the usual "no rest and no recovery" type of training that helped me to run John O'Groats to Lands End in 2007 and across the USA in 2011. As I said at the top of this post, the next 4 to 6 weeks are very crucially important. I must go into the running phase of my training in the best shape possible and with an established routine of eating. Aside from training there is the small matter of getting the remaining sponsors and overall headline sponsor on board. I've got 5 potential suitors in the pipeline. That's all well and good, the real challenge is getting 2 or more of them "over the line". Currently, there are enough funds to pay for flights, insurance, fuel, accommodation at the start and finish and food. There are no funds for the all important RV that will house the support team and I for 70 days. For that reason, I'm currently devising a "Plan B" that will see us use tents instead. The Support Team crew haven't signed up on that basis so there is a risk that some of them may have second thoughts. I would't blame them either given the prospect of camping in the middle of nowhere night after night. Time is ticking and it's so important that I get those final sponsors signed up. As I said earlier, these are crucial times! If you would like to become a sponsor of the run across Australia then please read the prospectus below. I'm pleased to report that the first major fundraising milestone has been passed for the Australia 2013 campaign. Thanks to the sale of Run Geordie Run t-shirts the £10,000 barrier has been broken. The grand total for The Sir Bobby Robson Foundation and The Children's Foundation stands at £10,009.67. It's still very early days but that's a great start to fundraising and the chances of reaching the £50,000 target became just that bit more realistic. Thank you to everybody who has made a donation or bought a t-shirt. Your money has gone to 2 very worthy causes and will be put to very good use. 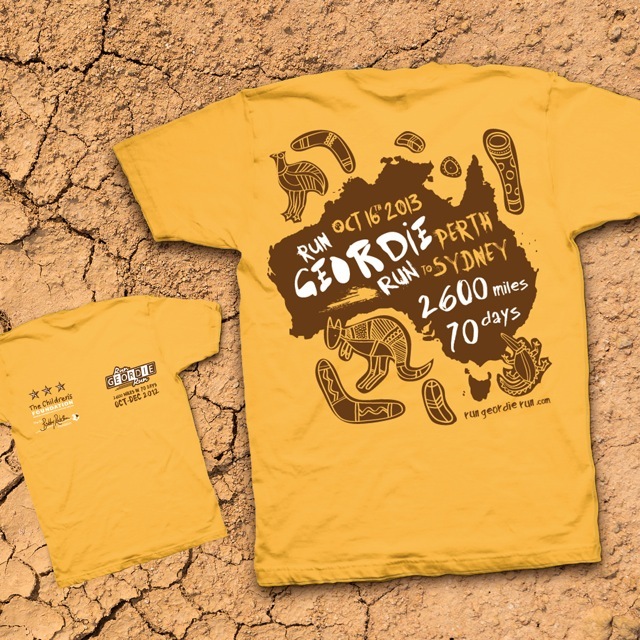 Speaking of t-shirts, the new Run Geordie Run t-shirt in technical fabric is now completely sold out. There are no plans to have any more made. Unless, of course, a generous business out there would like to pay for some more to be made. There is still a handful of cotton ones though so all is not lost if you would like to buy one. The t-shirts were only printed last Friday. I personally thought that the technical ones would sell out by the end of February. To be sold out within 6 days is testament to the amazing generosity of so many people. There is the small matter of the clever design by Dave Shenton and the generosity of Benfield Motor Group who paid for their production. The remaining sizes for cotton t-shirts are medium and large. The cotton t-shirt is £10 with the full £10 going to charity. Since the new Run Geordie Run t-shirts went on sale 2 weeks ago, over 160 have now sold in aid of The Sir Bobby Robson Foundation and The Children's Foundation. There aren't many left, so if you would like one then please get your order placed (using the form below) as soon as possible. I expect the technical t-shirts to be sold out this week, closely followed by the cotton t-shirts next week. The secret of the success of the sales, I think, is down to the particular design (pictured below) created by Dave Shenton.. Thanks again must go to Benfield Motor Group who paid for their production. It is because of Dave and Benfield's generosity that the entire amount paid for each t-shirt goes to charity. Brilliant! At the time of writing, T-shirt sales have helped the charity fund for The Sir Bobby Robson Foundation and The Children's Foundation burst through the £9000 barrier and the fund currently stands at £9,905.67. The fund is so close to the first major milestone of £10,000!!! Unlike previous years there are 2 versions of this t-shirt; a traditional cotton one and a "technical" one for use while out running and in the gym etc. The remaining sizes for cotton t-shirts are small, medium and large. The only sizes left in the technical version and medium and large. The cotton t-shirt is £10 with the technical t-shirt priced at £12. As you can see from the header of this website, I have some tremendous sponsors helping to make the run across Australia a success for The Sir Bobby Robson Foundation and The Children's Foundation. There is still the need for 1 or 2 more of the right kind of companies to back the run across Australia and share in it's success through sponsorship. Please click EXPAND on the document below to view the Australia 2013 sponsorship prospectus. Since the new Run Geordie Run t-shirts went on sale 2 weeks ago, over 100 have now sold in aid of The Sir Bobby Robson Foundation and The Children's Foundation. 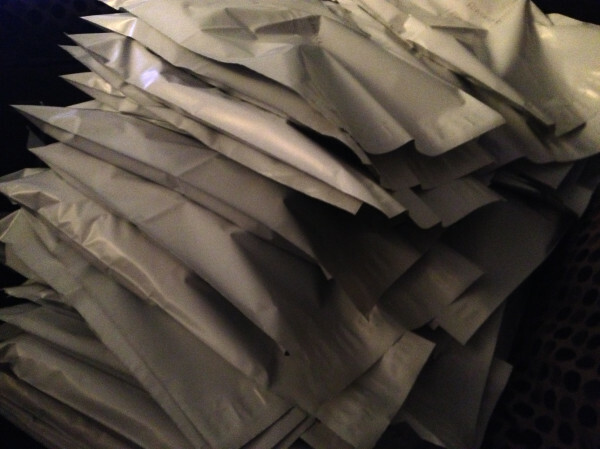 Last weekend was spent packing them up and I visited the Post Office this morning to get them sent off. It took 30 minutes to process all the packages. I tried not to look over my shoulder too much at the ever increasing queue of people behind me. I'm sure they wouldn't have minded if they knew that it was all for a good cause. There are t-shirts being sent all over the world with Australia leading the way on overseas orders. The USA is close behind in second place. I think this particular design by Dave Shenton (pictured below) has really helped them sell well. Thanks again must go to Benfield Motor Group who paid for their production. It is because of Dave and Benfield's generosity that the entire amount paid for each t-shirt goes to charity. Brilliant! T-shirt sales have helped the charity fund for The Sir Bobby Robson Foundation and The Children's Foundation burst through the £9000 barrier and the fund currently stands at £9,534.67. With a bit of continued generosity it shouldn't be too long before the £10,000 mark is reached. Unlike previous years there are 2 versions of this t-shirt; a traditional cotton one and a "technical" one for use while out running and in the gym etc. The cotton t-shirts are available in sizes small, medium and large. The only sizes left in the technical version and medium and large. The cotton t-shirt is £10 with the technical t-shirt priced at £12. It hardly seems any time at all since Team Run Geordie Run raised £2,949.59 for The Children's Foundation by doing the Great North Run in 2012. Pictured below are some of the team wearing those snazzy Run Geordie Run vests which were provided by my sponsor Benfield Motors. 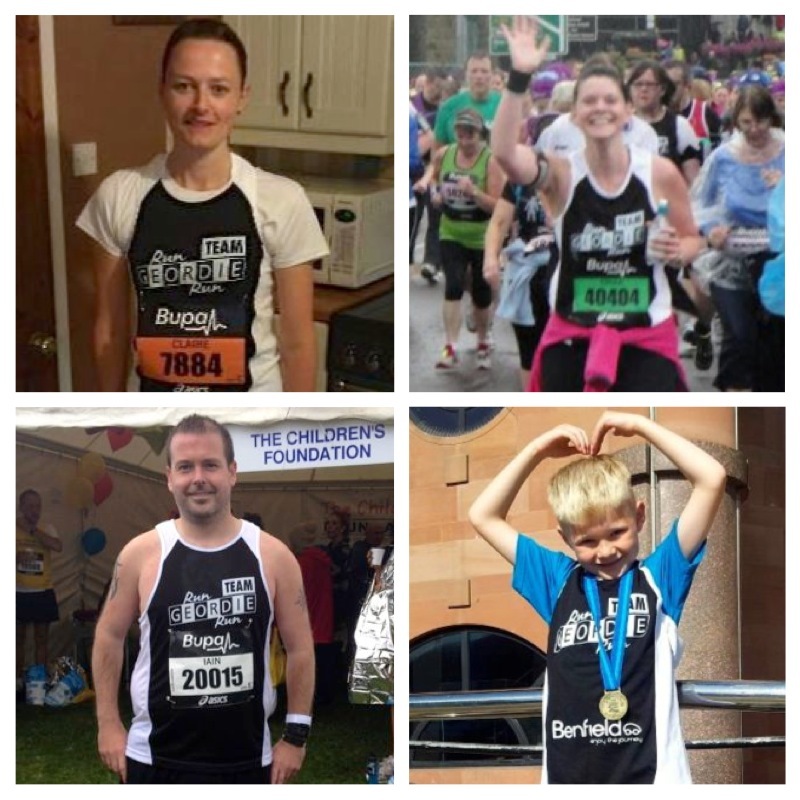 If you already have a place for this year's Great North Run on 15th September and have not yet selected a charity to raise funds for then why not consider joining Team Run Geordie Run and raise funds for The Children's Foundation? The minimum amount to raise is £100 and for that you will not only get a snazzy vest but also access to The Children's Foundation hospitality tent at the end of the run. There will be plenty of goodies to eat and drink there and, perhaps more importantly, access to an expert physio. 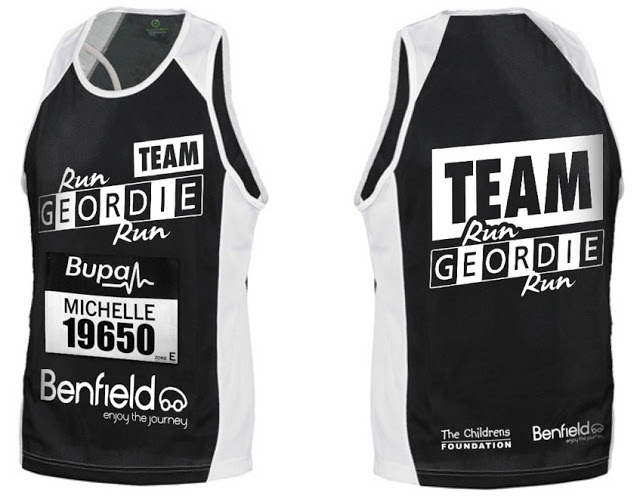 Please get in touch at sponsorship@rungeordierun.com if you would like to join Team Run Geordie Run in raising funds for The Children's Foundation. If you don't have a place then you can still run for Team Run Geordie Run but you will need to raise a minimum of £200 for The Children's Foundation and pay the usual entry fee. Please contact jonathan.clegg@nuth.nhs.uk for further info quoting "Team Run Geordie Run 2013". At the time of writing the team is already building nicely. It's going to take a lot of effort to beat last year's fundraising total but together I'm sure that, by running the 13.1 miles from Newcastle to South Shields, we can make a huge difference to the lives of children in the North East.